Earlier this year, Greenbelt Alliance teamed up with several other organizations to announce a bold yet realistic vision for a better Broadway. This fall, we recognized and applauded the positive impact this vision has had on Oakland’s Draft Plan Concept for the Broadway-Valdez area. Sure, there is lots this plan does not yet describe, including policies to attract quality jobs. Although it’s still largely at the 30,000-foot level, the plan is definitely headed in the right direction. 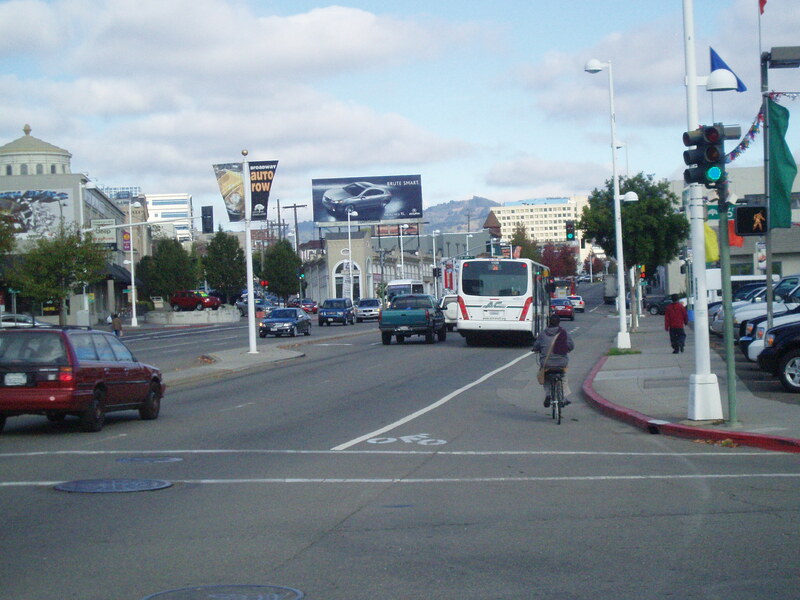 This stretch of Broadway is beyond just being car-oriented: since as early as the 1910s, it was known as the place in Oakland to go to buy a car or get one repaired—and it shows. Walking through the area, you will see vast seas of parking: seven lots, and six garages. The area has 5,041 parking spaces in total—but there is only demand for 4,000 spaces. In short, the area is doing perfectly fine with the parking it has. We applaud the City’s proposal to provide new parking only when it’s needed, and no sooner. The Draft Plan Concept calls for no new surface parking lots—hallelujah! Instead, all parking will be well-designed so as not to become an eyesore for the pedestrian walking by, located either in underground garages or in above-ground garages hidden within buildings. You may recall that Oakland has passed a groundbreaking Climate Action Plan, one of the boldest nationwide—and for this we should feel proud. In order to cut greenhouse gas emissions, the City will be implementing all kinds of sustainability measures with the resources they have, and also seeking new resources to do even more. The City has adopted our recommendation that the ratio of parking can be shifted down in each phase of development, as more customers and residents shift to taking transit or walking. Bravo. However, we have yet to hear how many parking spaces are planned for the district, or the exact ratios at which parking will be provided. During peak times when local demand for parking is highest, like rush hour, we can charge more for prime parking spaces than we do during the quieter times. We can also use parking pricing as a way to attract people to an area: if spaces are underutilized, the price must be too high. 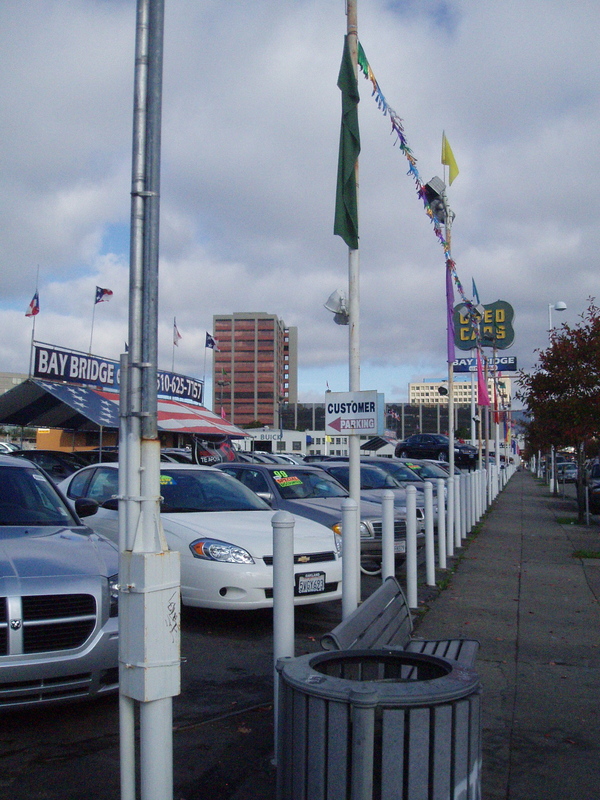 This concept of market-based pricing is fortunately listed as one of the many possible tools the City intends to use to temper the demand for parking in the Broadway-Valdez area, yet make sure you can always find a space when you need one. The biggest improvement in the eyes of Greenbelt Alliance is that the City has boosted the range of housing they want the area to accommodate. The City is planning for buildings of four to six stories along Broadway, with taller buildings off Broadway. Given its proximity to downtown, Broadway is a wonderful place for lots of homes in the form of buildings even taller than this. Oakland is planning for 900 to 1,800 homes in the area, 135 to 270 of those being affordable. Although we had hoped they shared our goal of at least 1,800 homes, we are thrilled that the City has bumped up the housing goal. New homes will make this area vibrant and alive, and will provide eyes on the street to help address current safety concerns. They could also help catalyze the retail the City of Oakland seeks here. Given that so many people are working nearby, we are pleased that Oakland has clarified its goal of at least 15% of the new homes here being offered at below-market rates. That is the minimum required by law though, so we want to see more than just the bare minimum, to benefit those already working nearby. We also want to make sure mixed-use requirements in the area are flexible enough that we avert vacant storefronts and allow affordable housing where feasible. Given where the economy is now, how can we get things happening here as soon as possible, to draw people into the area? The City sought to answer this very important question in the Draft Plan Concept. Your voice is needed! You can find the Draft Plan Concept at the City’s website. The City is accepting comments through Jan. 9, 2012. Greenbelt Alliance will be monitoring the plans, and the first draft of the Specific Plan will be available next spring. We will ask you to join us as this plan goes before the Planning Commission at that time, in a meeting to determine the scope of the environmental impact report. To sign up for email updates on the Broadway-Valdez plan from Greenbelt Alliance, visit www.greenbelt.org and put your email address in on the right sidebar where it says “sign up for news,” and then select the “Better Broadway Bulletin” on the next page. The silver lining of the economic downturn is that now is the perfect time to make forward-thinking, long-term plans for the future, ones that are flexible enough to respond to a turbulent market and build on what’s already working in Oakland. We are encouraged by the recent direction of the Broadway-Valdez plan, and we hope you’ll chime in too. Thank you for the great summation Marla! A couple of additional notes: advocates for including affordable housing have been attending the meetings. Here could be an opportunity to provide close-by housing for employees at the two big medical centers now under construction. And, there’s an opportunity for great re-uses of the surviving older buildings along Broadway, many of them former auto repair places or showrooms. It seems a fine chance to interlock with the arts activities around Telegraph in the 20s, and many of us are hoping that increasing focus on the commercial spine can link this stretch of Broadway with the recent developments in the uptown area. A question: what does everyone think of the big bump in office space square footage?